Currently unavaialble until further notice. Please chat with our friendly team, for alternative options. This activity is not suitable for children under 6 years. Children must be taller than 120cm. 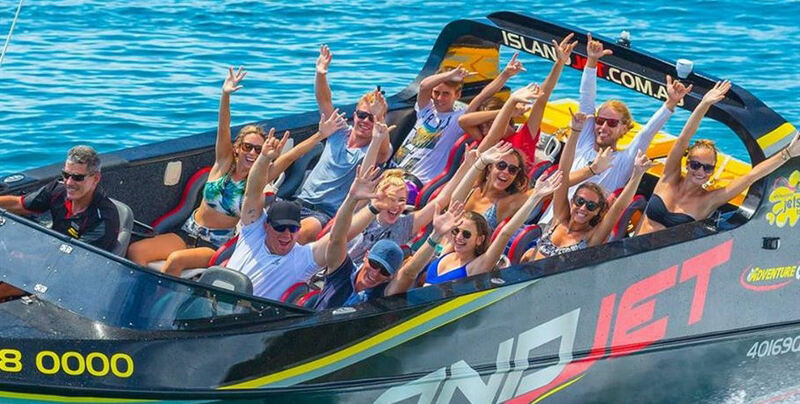 Experience an incredible 40km journey over 60 minutes of amazing sightseeing and thrilling speeds in the Whitsunday waters! 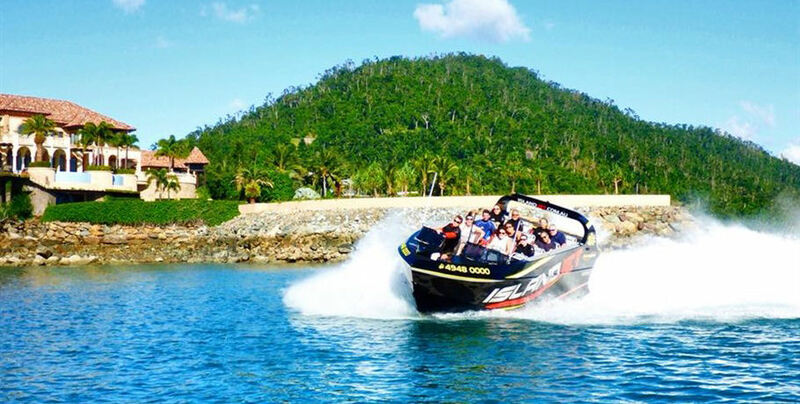 This scenic adventure includes the stunning waterways of Airlie Beach, South Molle Island and Daydream Island into a one hour tour of excitement. 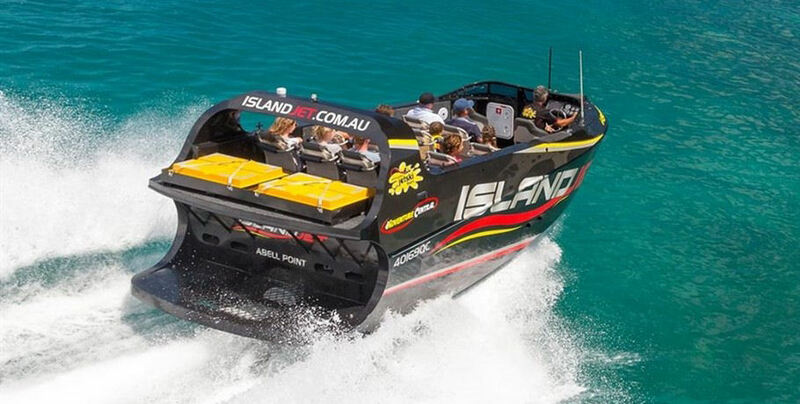 Island Jet- Jet Boating guarantee to get your heart pumping and adrenalin flowing for your Whitsunday and Australian bucket lists! 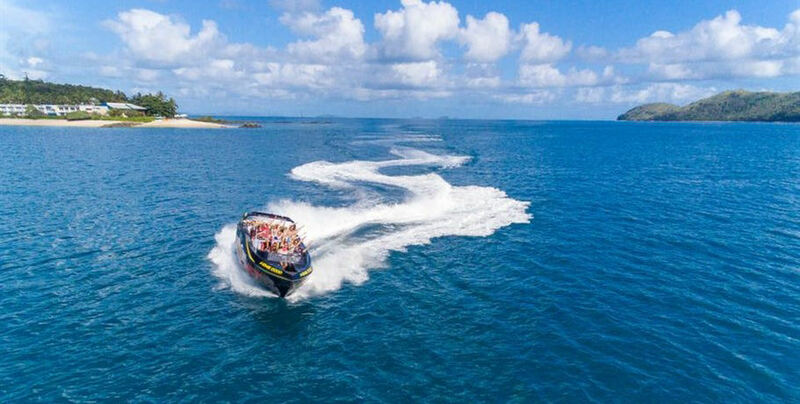 This small group of only 12 guests departs twice daily from Airlie Adventure Central at Abell Point Marina South Village. 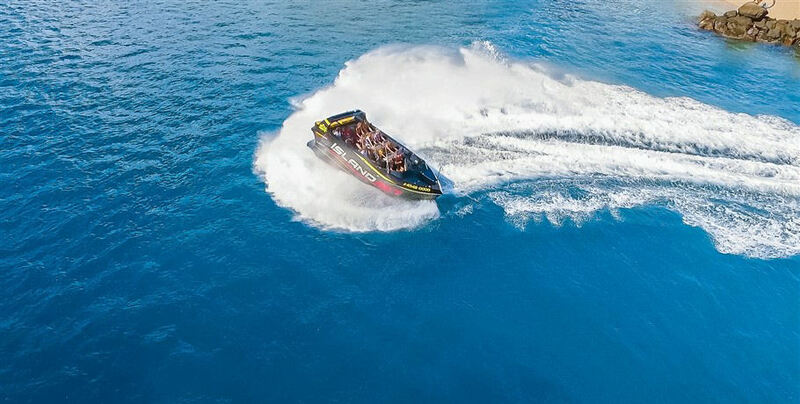 You will travel through pristine waters and feel the cool breeze in your hair as the jet boat performs tricks in the Whitsunday Passage. 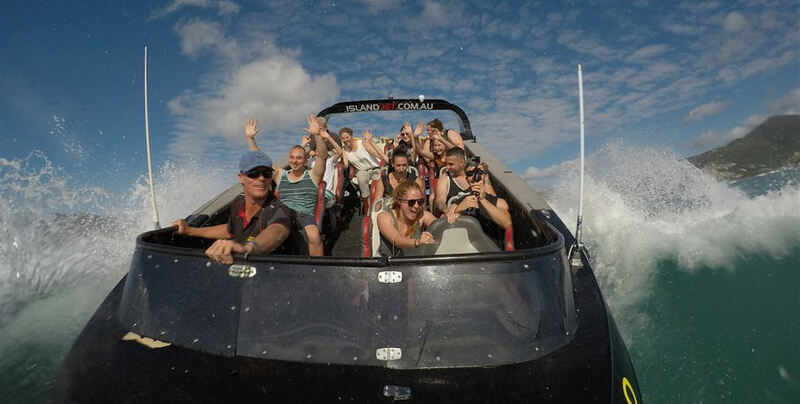 Matching thrill-seeking with pleasure viewing this adventure is not to be missed! Your tour also includes courtesy coach transfers and complimentary photos. Cancellations made after 6pm the night before tour or ‘no show’ will incur a 100% charge. Management reserves the right to change itinerary or times in extreme weather conditions. If a cancellation is necessary guests will be offered an alternate day or full refund. Liability: Clients should note that adventure travel involves risk. Whilst we make every effort to safeguard our clients, we cannot be held responsible for personal injury or loss due to the actions of the clients which are beyond our control. A signed release will be required from all participants on departure. We recommend you take out travel insurance and assess your suitability to this activity prior to commencement. Due to the nature of using digital cameras in the harsh saltwater operational environment, adverse weather conditions, and the possibility of operator error or camera failure, we cannot guarantee provision of photos. Valid until 31.03.2019. 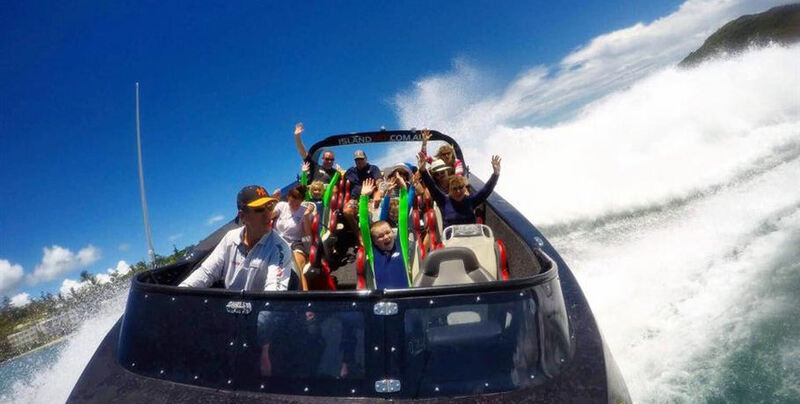 Experience a one-hour exciting offshore jet boat ride through the iconic Whitsunday waters- zooming at high speed with amazing sightseeing thrills and spins! Spread out over a 40km journey of pure adventure, this tour is not to be missed! 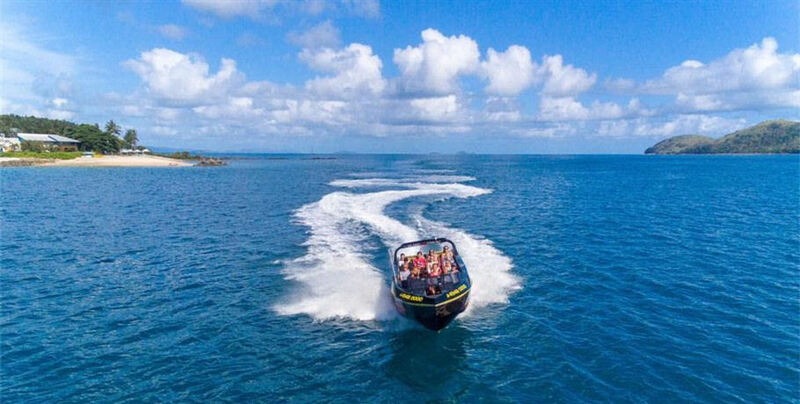 Explore the National Park wonders that surrond Airlie Beach, with stunning 360 degree views of the Whitsunday Islands and Tropical Rainforests. 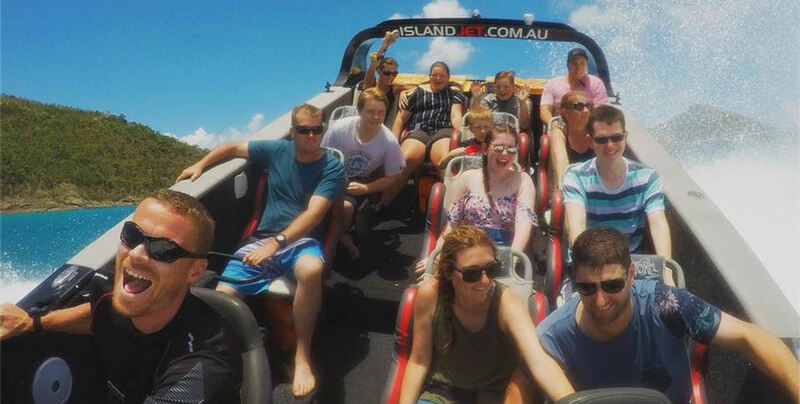 Spend a blissful few hours enjoying the Great Barrier Reef in Hardy Lagoon! Perfect for those wishing to experience the reef both in and out of the water! Enquire today! 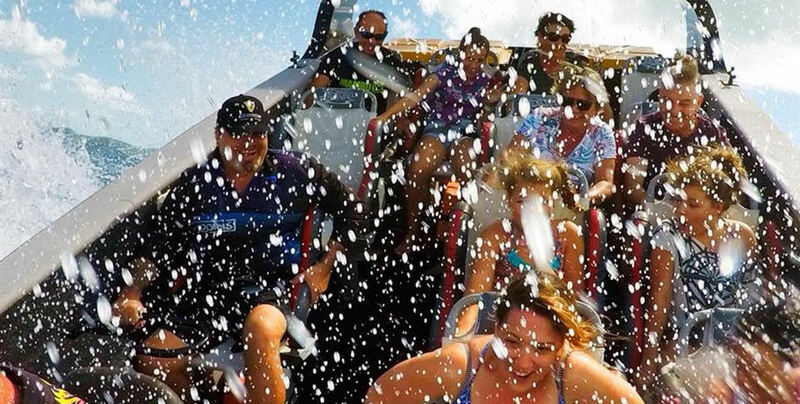 Choose from three amazing options for the most thrilling ride of your life! This Soviet era plane will have you feeling like a real fighter pilot against the stunning backdrop of the Whitsundays! Enjoy an incredible helicopter flight to one of the most iconic beached in the entire world- Whitehaven Beach! This scenic flight over the stunning Whitsunday Islands will take anyone’s holiday to the next level! 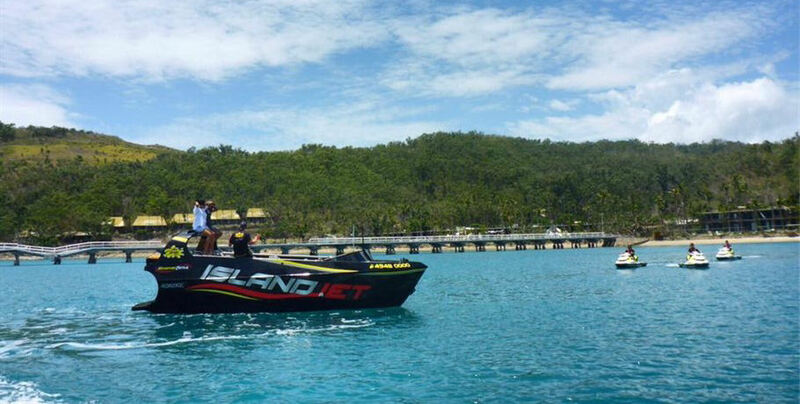 Explore the natural beauty of the Airlie Beach coastline with a thrilling one hour guided jet ski tour! Perfect for beginners and families- book now so you don’t miss out! 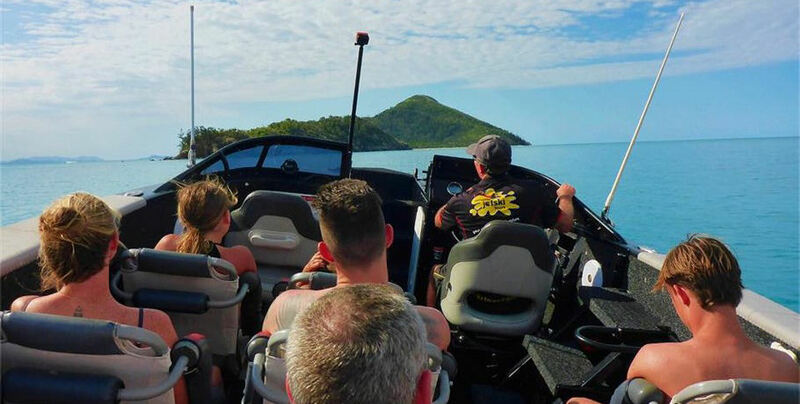 For the adventurous traveller- enjoy the longest time possible on a jet ski adventure exploring the stunning azure waters of the Whitsundays! Get your heart racing with us today! Perfect for a honeymooning couple- relax in the late afternoon sun with a glass of champagne in hand for the best end to any day in the Whitsundays! Enjoy a fun guided tour of the Conway National Park rainforest in this exciting 9km interpretive journey! Ride your own Segway and experience the magic of lush rainforest from a different perspective! 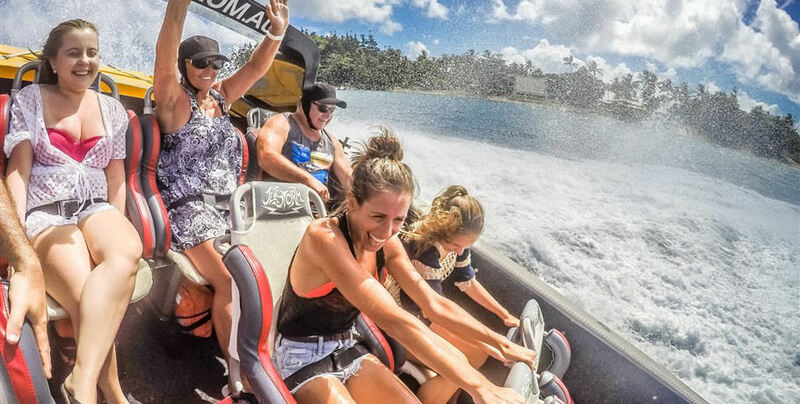 A perfect introductory Airlie Beach experience, this boardwalk Segway journey will show you the magic of the water’s edge! Feel the breeze in your hair on this 7km round trip today! 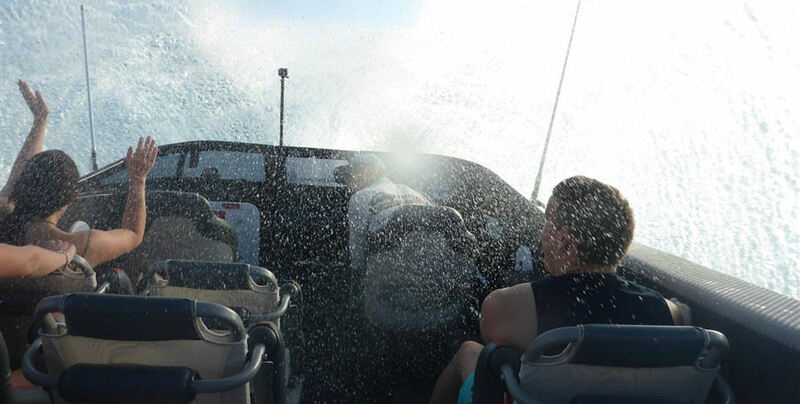 The Whitsunday Jet Ski Tours offer only the best in adventure tours throughout this beautiful region. 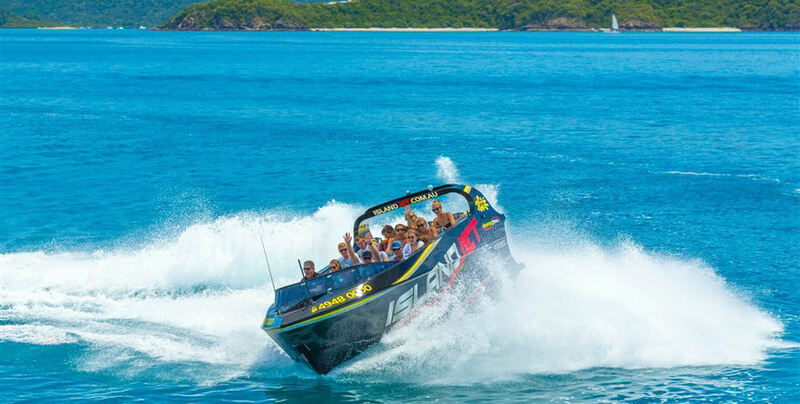 Ride your own Sea-Doo as you visit beautiful South Molle Island and more today! 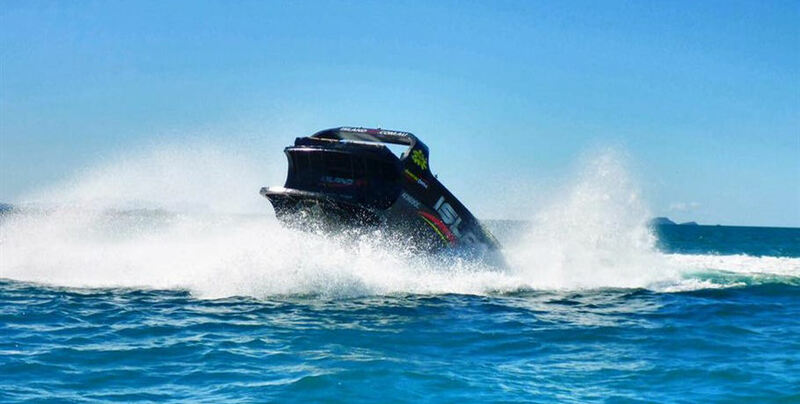 Ride your very own Sea-Doo GTI 1500 cc jet ski through the beautiful Whitsunday Island Marine Park on this incredible adventure! 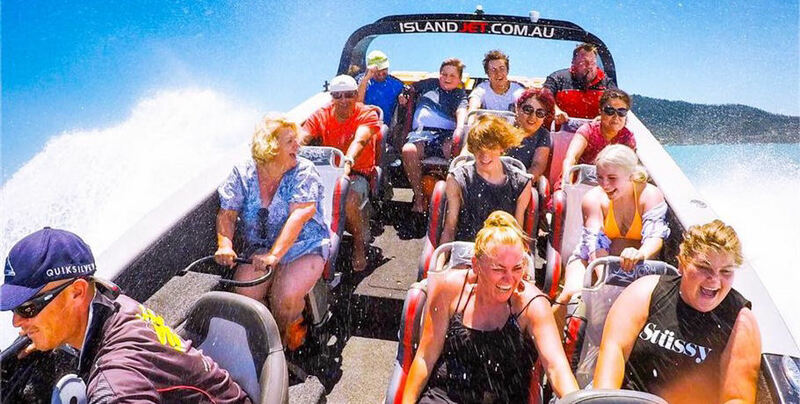 Fun for the whole family with no license necessary- book today!